FILE - The plaque of the Al-Mahabba mosque is seen in Alencon, France, November 25, 2015. The voice claiming Islamic State's responsibility for the deadly Paris attacks is known to many in the small French provincial town of Alencon. In the wake of the Paris attacks and security alerts in Belgium, Italy and Germany, Europe’s intelligence services and politicians are turning their attention to hundreds of unofficial or unlicensed makeshift mosques operating in apartments and homes in migrant-dominated areas. Politicians in several EU countries are demanding greater scrutiny of unofficial mosques and even their closure. This is prompting accusations of racism from some Muslim leaders who warn the move to shutter makeshift mosques will lead to provocative raids, handing jihadists a propaganda coup. The Italian interior minister has announced plans to close unlicensed mosques as part of Rome’s fight against terrorism and to curtail recruitment by jihadists of foreign fighters. “We are going to close the clandestine and unregulated places, not to hamper the religion, but so that it can be practiced in places which are in order,” Angelino Alfano said during a speech in which he warned of the potential dangerous influence of non-registered places of worship, where many of the estimated 1.5 million Muslims living in Italy go to pray. “In Italy, we have four mosques and over 800 places of Muslim worship,” he said. Italian intelligence officials have long complained they don’t have the resources and manpower to monitor all unofficial places of Muslim worship in the country. The threat of closure has triggered fierce protests from some Islamic leaders who say Italian Muslims are forced to attend makeshift places of worship inside homes, shops and apartments because the building of mosques is blocked by unsympathetic and anti-immigrant local authorities. Across Europe there are an insufficient numbers of mosques: Germany has 140 for more than four million Muslims and Britain has around 200 mosques for three million. Greek Muslims have been campaigning to build a mosque in Athens for decades, but the city remains the last EU capital without an official mosque. The Greek government has approved an official mosque to be built in Athens, home to an estimated 200,000 Muslims, several times, but court challenges and appeals by right-wing groups and the Greek Orthodox church have blocked development. Last January, Lombardy’s right-wing regional government approved provisional legislation that would make it virtually impossible to build new mosques. Nicknamed the “anti-mosque law”, the Lombardy measure limited the building of any new houses of worship for religions that are not recognized by the Italian State. The only major religious group that falls into that category is Islam, which is the second-most observed religion in Italy. 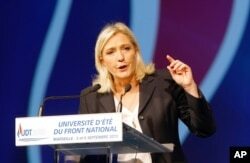 Following the Paris attacks last month, Marine , the leader of France's far right National Front party, called for the banning of militant Islamic organizations and the closing of radical mosques. She has also called for a licensing system for all informal, unofficial mosques. Her supporters say with more than 2,000 mosques in France, makeshift ones are not needed. FILE - Leader of France's far-right National Front party Marine Le Pen is seen delivering a speech in Marseille, southern France, Sep. 6, 2015. Some informal mosques are known to be overseen by imams who embrace extremist dogma or rhetoric. But with unlicensed facilities, no one but worshippers know who is attending and what is being preached, so it remains unclear how much the unregulated places of worship are contributing to nurturing a narrative encouraging radicalization and legitimizing hardline ideology. Opponents of the focus on the makeshift mosques say jihadist recruitment is taking place online, “Google Imam” as some analysts call the grooming via internet by recruiters. They argue shuttering mosques and deporting radical imams (France in the past year has expelled 10) won’t prevent attacks like those in Paris that left 130 dead and more than 350 injured. But proponents and opponents of the focus on mosques don’t fall along obvious political or religious lines. 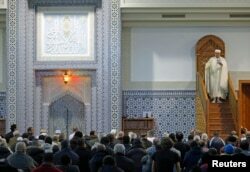 The head of the French Council for the Muslim Religion has called for a regulatory system, arguing that in the fight against jihadist ideology the state should manage imams. They should only be allowed to preach, if they have received a permit. Anouar Kbibech, who likens the permit to a driving license, says imams should “respect the laws of the Republic” and promote a “tolerant and open Islam”. Members of the Muslim community attend the Friday prayer at Strasbourg Grand Mosque, one week after the deadly attacks in Paris, France, Nov. 20, 2015. “To ask the imams to read the sermon in French is counterproductive. It wouldn’t help solve the problem,” he said. “What matters is the subject of the sermon. It needs to clear, and strong, and condemn extremism and terrorism,” he told the news-site The Local.